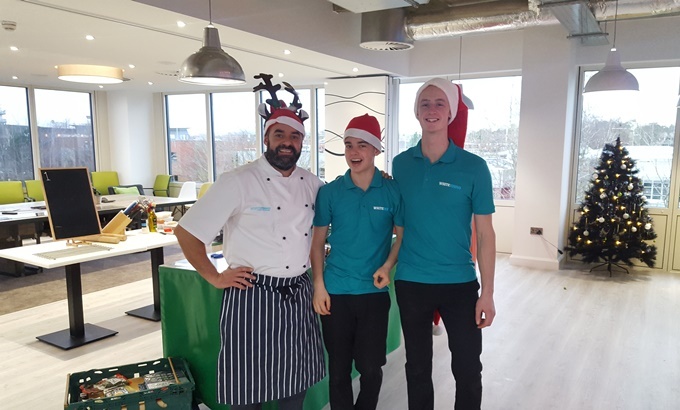 Home » Blog » Cookery Team Building: ‘Canapé Creations’ Kicks Off Chritmas for FCB Halesway! The team at FCB Halesway approached White Rhino in November looking for a team building activity they could run before their Christmas party. The chosen activity needed to be fun and engaging for all the participants, and needed to get everyone into the festive spirit. After speaking with the team, we suggested that ‘Canapé Creations’ would be a perfect fit for them. 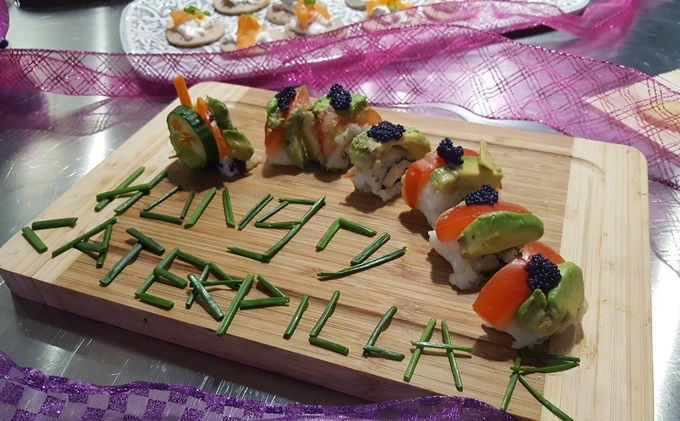 As well as providing an interactive, hands-on challenge for everyone, it would also allow the participants to create their own canapés which they could enjoy before moving on to their Christmas meal. FCB Halesway loved the idea of this activity! The FCB Halesway team wanted the event to be a complete surprise for those taking part and so our arrival and setup had to be meticulously planned to ensure nobody caught a glimpse of any of the equipment or crew prior to the event starting. Once all the equipment was set up, the ingredients displayed, and customary chefs hat and aprons laid out, it was time for the crew to welcome guests into the newly created ‘canapé kitchen’. Thankfully our sneaking around prior to the event had paid off and nobody suspected a thing which resulted in lots of surprised faces as people entered the room. Once the challenge had been set by the head chef, teams were set loose to start creating their own canapés. We provided all the necessary cooking equipment, utensils, and ingredients for the teams to use when creating their canapés, as well as plenty of guidance and advice from some expert chefs. The finished canapés created by the teams were superb and went down a storm with all those taking part. ‘Canapé Creations‘ is a brilliant cookery team building event that can be run pretty much anywhere. All that is needed is a single, large room. During this event, we were able to utilise a fantastic ‘café’ style space at the FCB Halesway offices which worked brilliantly. 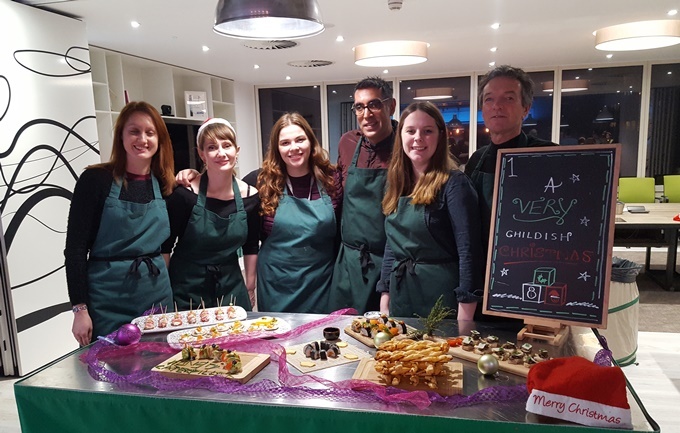 This entry was posted in Team Building Activities and tagged Team building activities, Corporate Team Building Activities, cookery team building, alternative christmas party, canape team building, canape making team building, canape creations. Bookmark the permalink. ← Conference Planning: Take your Q&A Sessions to the Next Level with Slido!